We had an overnight trip on the Boss Lady and had a great group of guys with us for the trip. Everyone was stoked to get out there and have some fun in the deep. It was fairly windy and choppy, but fishable. We got out to the East Notch of the WIlmington Canyon in 75 degree green water with plenty of pilot whales around. 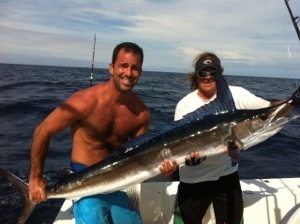 We were hooked into a bigeye at 5:30. It ate a green machine spreader bar on the short shotgun. After taking a few turns on the rod, Scott was on the fish to finish it off. Everyone put good pressure on the fish and we saw color once, then it dove again. Two and a half hours into the fight, the fish was playing its game of give and take and the main line parted. Major disappointment! With that, the sun had already set so we setup on the chunk. We were targeting tuna, swords, and makos, really anything that wanted to eat. We wound up making a move once to start another drift up through the tip of the canyon, but we had no marks, no bait, and it was a long night with no action. We got up on the troll around 5:45 am and trolled until with no action except from a small dolphin. The winds were hard out of the NE and it was time to pack it up and run back to Townsend’s Inlet. I ran the Trade In today and we were on a search and destroy mission. With the extremely tough fishing the past two weeks, we knew we were going to have to work hard to find our fish. We planned on starting out int he deep, but choppy seas made us stop well short of our desired destination and were were trolling in the dark at Lemkes starting at 4:45. Once we had grey light we could see the slicks and birds were there, and we ended up getting a double header on decent sized gaffer dolphin. We pounded the area hard until 11 am without a bite, and two other boats in the area weren’t getting bit either. The seas calmed down a bit, so we decided to sprint to the deep. We made it out to the deep of the Spencer Canyon by 12:30 and it didn’t take long to get our first white marlin. 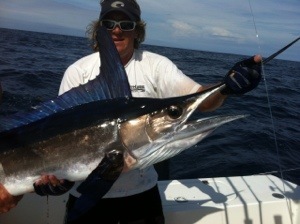 Mo brought that one to the boat beautifully and we got the hook out and released the white. 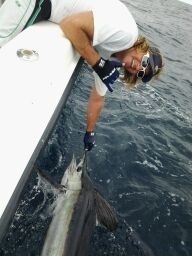 We ended up having a blue marlin try and eat our dredge and then fade and picked up another white while we were there. At 4:30 we packed it in so we could make it home by dark. The water temperature went up as we hit 500 fathoms and the pretty blue water was at 900 fathoms with water temp at 77.5. We had a lot of scattered weed, a small weed line, flying fish everywhere, and were marking bait here and there. I was surprised we didn’t get more bites, but we just didn’t have much time to work the area. All in all, fun day, but a long one for sure. Today we ran out on the Boss Lady to an inshore area that has had a pretty exceptional tuna bite. We made our way out at 18 knots in the short period swell that was in our face, but made it just by sunrise. We had lines in and were trolling in 75 degree fairly blended blue water. Bill worked the area hard all day, and we had some tuna marks and sand eels, but no bites. At the end of the day we decided to try to jig up the tunas but no luck there either. We did manage to see a free jumping blue marlin which was unusual for being so far inshore, but there are no fences out there. All in all, very frustrating day without a single knock down. The weather was fairly nice all day other than the 15 knot West wind that came up middle of the day. So I can’t tell if I fished two days (Sunday and Monday) or if I had an extreme case of deja vu…. I captained the 54′ Ocean Yacht ‘Fin Addict’ on Sunday and with the lack of reports and absolutely no satellite shots the past few days, we kept it simple and headed for the Wilmington Canyon. The Pilot whales were all over the center of the canyon, but I wasn’t getting any marks on the sounder and nobody had much action. I worked the whole east wall, pushed out to 500 fathoms and worked back into the west wall with nothing to show for it. We decided to take a break and deep drop for some tilefish and we wound up catching 8 decent golden tilefish then got back on the troll. I was pushing back inside where we found a small school of dolphin and put 5 of those in the box, then we picked up and headed for home. On the way in, right on the Indian Arrow Wreck on the 30 fathom line we saw hundreds of chick birds picking, hundreds of dolphins everywhere and about 20-30 finback whales. We had to stop and see what we could find. We only had 20 minutes and I marked wads of bait and sand eels but no fish. So we ran right out to the Lindy where the Bigeye bite has been pretty consistent. I was on the Trade In and we were ready to do battle. We were trolling by 5 am and the whales where scattered unlike the past two mornings. There were 5 boats working the canyon hard and fishing was slowwwww. We had one round if skipjack bites and that was it. A friend on mine ended up getting covered up with bigeyes at 10:30 am and was in 3 for a couple hours. They ended up boating 1/3. None of us could get a bite all day. Around 1:30 pm we finally got an amazing bite from a huge blue marlin. It was every bit of 600+ and it ended up pulling off. Such a disappointment. I want that one back!!! The water was down a degree but the whales did get tight in the middle of the canyon around the time my friend hooked up. Not sure if they just didn’t come up or what, curious to see what happens in the next few days.